The impact of the Beijing-based center and research fund has been far-reaching on campus and in China. In launching the Penn Wharton China Center (PWCC) in Beijing and the Penn China Research and Engagement Fund (CREF) on March 10, 2015, she reiterated the call for social impact and global engagement. Penn is emerging as the premier institution to offer insight into the future of China. 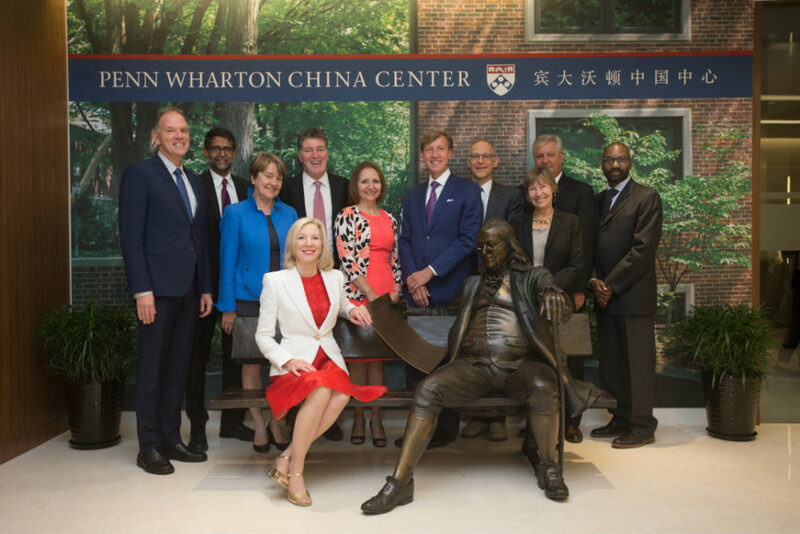 Pictured on the Ben on the Bench sculpture at the Penn Wharton China Center in Sept. 2015: Penn President Amy Gutmann (seated) with (from left to right) Wharton Dean Geoffrey Garrett; Penn Engineering Dean Vijay Kumar; former PennDesign Dean Marilyn Jordan Taylor; former Penn Dental Dean Denis F. Kinane; Penn Nursing Dean Antonia Villarruel; Perelman School of Medicine Dean J. Larry Jameson; Vice Provost for Global Initiatives Ezekiel Emanuel; Graduate School of Education Dean Pam Grossman; Penn Arts and Sciences Dean Steven J. Fluharty; and School of Social Policy & Practice Dean John L. Jackson Jr.
Penn CREF is a five-year, $10 million competitive matching program designed to stimulate and support activity in China and engagement with PWCC. The result has been growing interest in China across all of Penn’s 12 schools. CREF-awarded research largely falls into five themes, which, in turn, are informing Penn’s ongoing and future engagement in China: health and health care; business and political economy; innovation and technology; urban development; and media, culture, and humanities. As of January 2018, CREF has facilitated Penn’s commitment to collaboration and innovation. The fund has supported 28 proposals at a funding level of $5.4 million, enabling collaborations between Penn faculty members across schools and more than 35 unique Chinese institutional partners and seven organizations around the world. In addition to supporting faculty research and student activities, and facilitating new relationships with Chinese institutions, PWCC also serves as a base for almost 2,000 Chinese students studying and learning on the Penn campus and more than 4,500 alumni from all over the world who call China home. “In the past three years, PWCC has become a bustling place where our students, alumni, parents, and friends gather to learn and to exchange new ideas. It is a place for knowledge dissemination, for lifelong learning, for cutting-edge ideas, and for reminiscence of the Penn and Wharton experience. In short, it is a happening place in Beijing,” said PWCC Director John Zhang, Wharton’s Tsai Wan-Tsai Professor of Marketing. In a large classroom at the Penn Wharton China Center, scholars from Penn’s Fox Leadership International program and Kleinman Center for Energy Policy present work in the area of U.S.-China energy and environmental cooperation as part of the Dimensions of U.S.-China Leadership conference in Oct. 2016. The University also launched Forerunner China, a student-orientation program organized by Penn Global and the International Student and Scholar Services (ISSS). Held at the PWCC, the program ensures that international students can hit the ground running when they arrive in Philadelphia. The program has been so successful that it was replicated in India in 2016. Forerunner China has continued to grow, from 150 participants in 2015 to more than 240 in 2017, with 149 new graduate and undergraduate students and 99 others, including new parents, current students, current parents, alumni, and Penn ISSS staff. 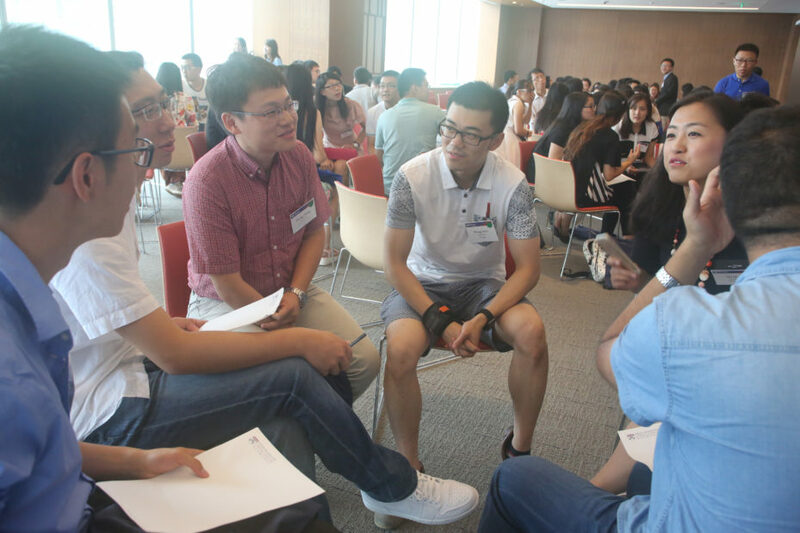 Participating in Forerunner China, Penn graduate students Hong Zhang, Arts and Sciences, Lixu Wang, PennDesign, and Xia Qu, Penn Law, help to pre-orient admitted Penn students at the Penn Wharton China Center, July 2015. In 2017, the Beijing-based Center brought together students, alumni, and expert faculty at dozens of events each month — more than 100 in the year — ranging from CREF symposiums to alumni receptions, gatherings, and lectures featuring industry thought leaders from the U.S. and China. 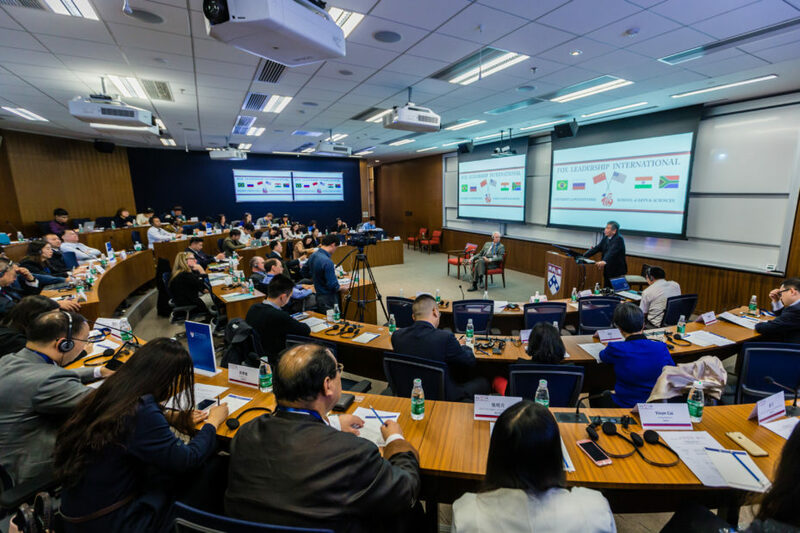 In the Global Business Week program, held in September and led by Karl Ulrich, Wharton’s vice dean for entrepreneurship and innovation, PWCC hosted 60 students from the MBA Program for Executives. The program included a week of daily on-site visits to a number of leading local corporations, such as Hua Wei, Tencent, and Alibaba, and concluded with debriefings at PWCC. The program culminated in final presentations and a panel with two local Wharton alumni, Mi Dai, WG’10, from Joy Capital, and Xing Liu, WG’04, from Sequoia Capital. In addition to Penn’s standing as a leader in innovation and entrepreneurship, the University’s reputation as a research powerhouse is also represented by the CREF symposiums held at the PWCC. Many CREF projects are reporting progress on the Fund’s goals of research, engagement, innovation, and impact. 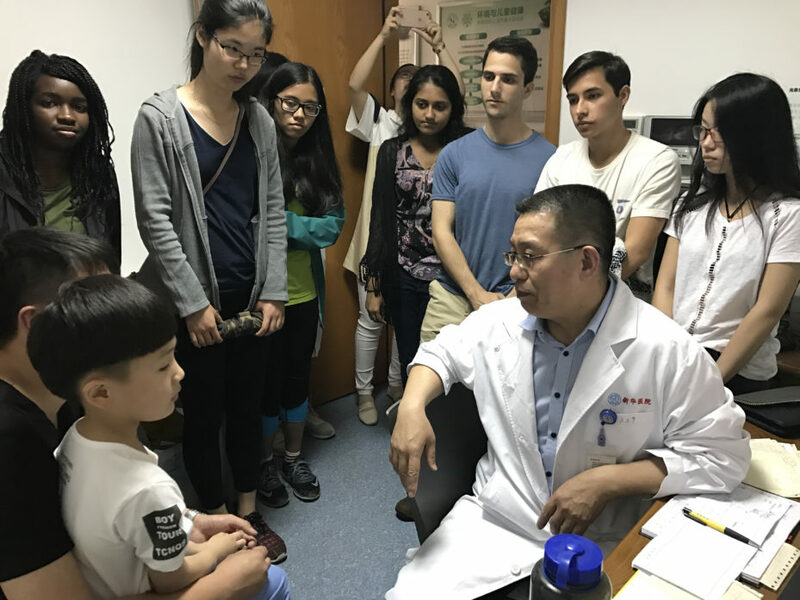 CREF is helping to expand on the long history of cooperation and engagement between medical professionals at Penn and in China: University graduates first traveled to China in the 1820s and were prominent collaborators in developing Western medicine there. 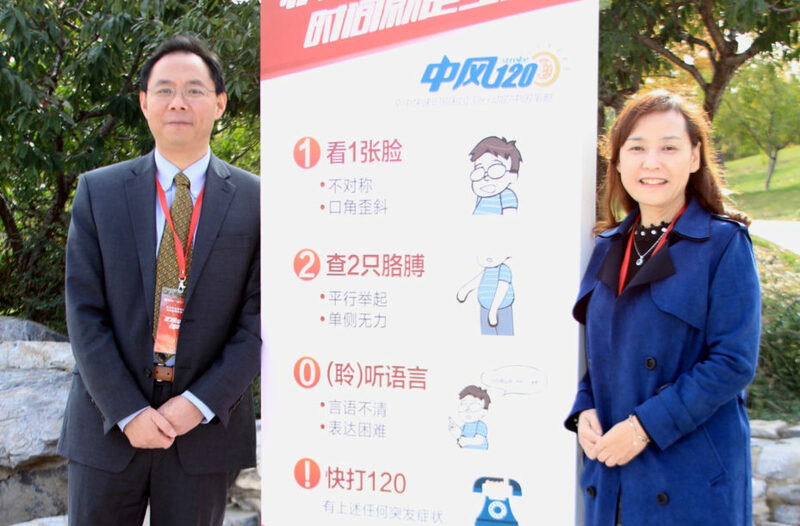 Renyu Liu, associate professor of anesthesiology and critical care at Penn’s Perelman School of Medicine, received a 2018 CREF award to enhance the stroke awareness campaign in China. There, 2 million stroke patients die each year — five times the mortality rate for stroke in the United States. The program’s goal is to improve stroke awareness, rapid recognition, and reducing pre-hospital delay. Penn’s Renyu Liu (left) and Fudan University’s Jing Zhao with a campaign poster for the Stroke 1-2-0 strategy. In June of 2017, R. Liu was at PWCC to help promote a new series of videos about the Stroke 1-2-0 Rapid Response Program produced in a number of dialects. That campaign was jointly launched by the Special Action Group of the CSA, Tencent Public Welfare, Tencent News, PWCC, and Life Times. The day after Stroke 1-2-0 was published online in Lancet Neurology in September of 2016, the program was officially endorsed by the Chinese Stroke Association (CSA), followed by widespread media and television coverage throughout China. It has since been incorporated into CSA’s practice guidelines. Hours after China Central Television broadcast a special introduction of Stroke 1-2-0 nationwide, the station’s social media account Weibo had more than 101 million views of the program. The potential impact of the campaign and the related research is profound, and the China-specific program has grown into an international effort. Yuchi Han’s project, now in its third year, advances cardiac imaging techniques in China and has helped to train more than 170 cardiologists, radiologists, technologists, and physicians throughout the country. 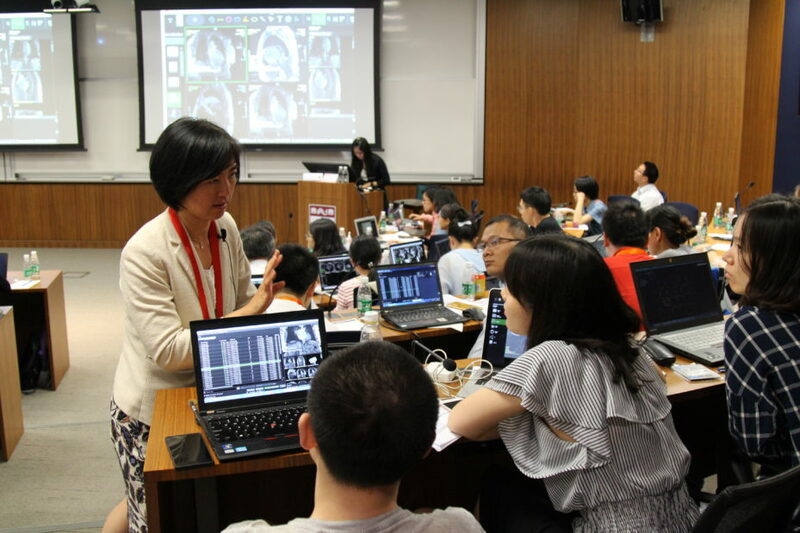 Through CREF, Han and colleagues have organized a Penn China Advanced Cardiovascular Imaging Training Course held at the PWCC as part of an annual Cardiac Imaging and Cardiac Intervention Summit since 2016. Penn Medicine’s Yuchi Han discusses case studies with cardiologists attending the 2017 Penn China Advanced Cardiovascular Imaging Training Course at the Penn Wharton China Center in Beijing. Han, assistant professor of medicine at the School of Medicine, along with Penn Medicine’s Howard Herrmann, Dinesh Jagasia, Ron Jacob, Walter Witschey, and Harold Litt, has also given lectures and presented case studies to participants via quarterly teleconferences. The ongoing partnership with PLA General Hospital in Beijing, West China Hospital in Chengdu, and Shanghai Renji Hospital has resulted in numerous publications. In the area of CREF-supported health and health care, Penn’s schools of Dental Medicine, Nursing, and Veterinary Medicine are also represented. In 2017, Penn Global awarded Nursing School Associate Professor Jianghong Liu funding to organize and teach a multidisciplinary Global Seminar, “Environmental Health Issues and Global Implications,” which introduces students to the field of environmental health using interdisciplinary methods. The course is meant to expose students to the basic principles of environmental toxicology and epidemiology. Penn Nursing students with graduate students from Jiao Tong University at Shanghai’s Key Laboratory of Environmental and Children Health. Pictured center bottom row are, left to right, Shanghai Jiao Tong University’s Jian Xu and Chong-Haui Yan, and Penn’s Jianhong Liu. This spring, J. Liu is offering the campus-anchored course for the second time. 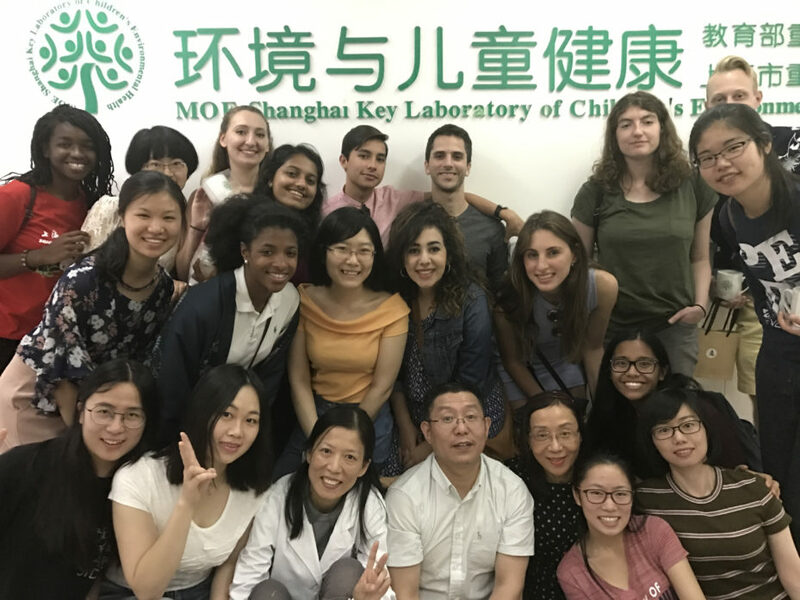 Last May, she traveled to China with a group of students, spending two weeks in Beijing, Nanjing, and Shanghai, where, in collaboration with Shanghai, Jiaotong, and Southeastern universities, they studied the toxicity of environmental lead exposure. The seminar builds on J. Liu’s major NIH-funded longitudinal study in China, where, for the past 10 years, she has researched the effect of early lead exposure on 1,600 kindergarten children in the industrial city of Jintan, about 100 miles northwest of Shanghai in the eastern part of the country. Penn Nursing students visit “Dr. Lead” Chong-Haui Yan’s Clinic in Shanghai. Yan is an expert in pediatric lead toxicity. In another CREF-funded project, a Penn Vet-Wharton team is partnering with Chinese pork producers to study the country’s pork industry and improve China’s business practices and expansion while addressing animal welfare and food safety and embracing ideas of efficiency and sustainability. The study is led by Thomas Parsons, associate professor of swine production medicine at the New Bolton Center and director of the Swine Teaching and Research Center, and Wharton’s Anne Greenhalgh, deputy director of the Anne and John McNulty Leadership Program and an adjunct professor of management. Together, Parsons’ team at Penn Vet and Greenhalgh and her Wharton colleagues arranged the first gathering of a delegation of Chinese pork producers — representing three of the six largest pork producers in the country — as well as Chinese academics, at the PWCC in the spring of 2017. In September, the delegation from China traveled to Philadelphia for a mix of seminars at Wharton and hands-on learning at Pennsylvania swine farms, feed mills, and slaughterhouses. Last June, for the third consecutive year, the PWCC hosted a symposium on communications with Guobin Yang, the Grace Lee Boggs Professor of Sociology and Communication in the Annenberg School for Communication. The two-day symposium, “Digital Formations and Chinese Experiences,” was jointly organized by Penn, the University of Wisconsin-Madison’s Department of Communication Studies, and the School of Media and International Culture of Zhejiang University. Upwards of 70 scholars from more than 30 domestic and foreign universities attended the symposium, which addressed the way institutions and practices associated with Chinese digital networks such as WeChat and Weibo have revolutionized numerous cultural, social, political, and commercial patterns in the country. Participants in the inaugural Penn Media Scholars in China program, top row, left to right, Ran Liu, Danielle Goh, Nick Hunsicker, Gene Pak, and Prof. Guobin Yang. Bottom row, left to right, are Skylar Tang, Nick Joyner, Youlim Lee, Joy Lee, and Karen Yang at China Radio International, June 2017. With funding from Penn Global and CREF, Yang also led the first Penn Media Scholars in China program, immersing students in China’s media industries, institutions, and citizens’ everyday media practices. Eight Penn undergraduates participated in the inaugural course. 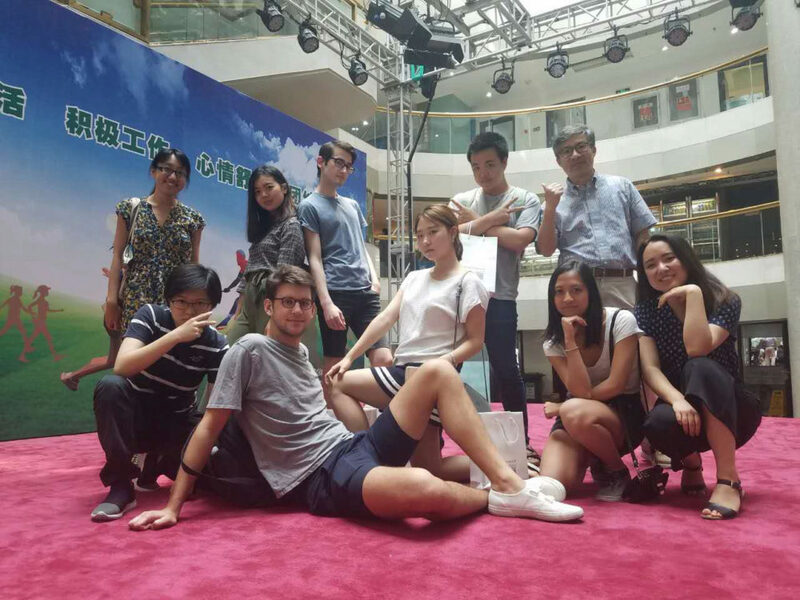 They attended the June symposium and spent three weeks between Beijing, where they were hosted by PWCC and the School of Journalism Communication of Renmin University, and the city of Hangzhou, where they were based at the College of Media and International Culture at Zhejiang University. Nick Joyner, a junior from San Antonio, Texas, who is double majoring in cinema and media studies and communication, said the course opened his eyes to new possibilities and experiences. 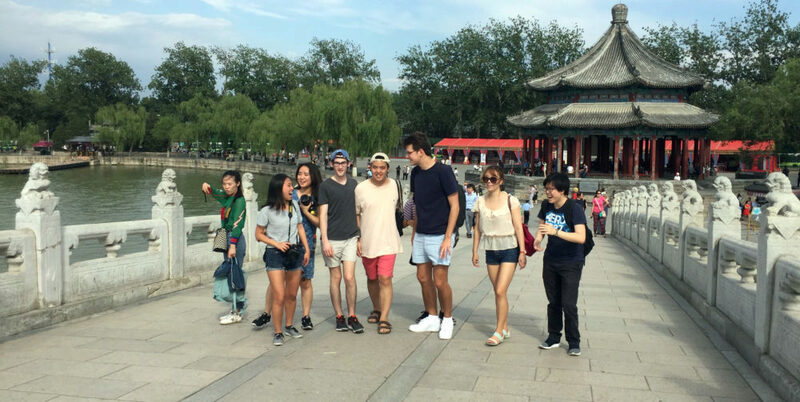 Left to right, Danielle Goh, Joy Lee, Karen Yang, Nick Hunsicker, Gene Pak, Nick Joyner, Youlim Lee, and Skylar Tang visit the summer palace, Beijing. Expanding student opportunities in China is a big part of the mission of PWCC, which offers resources and services for students, faculty, and alumni. The Center also serves as a gathering place for the Penn community. 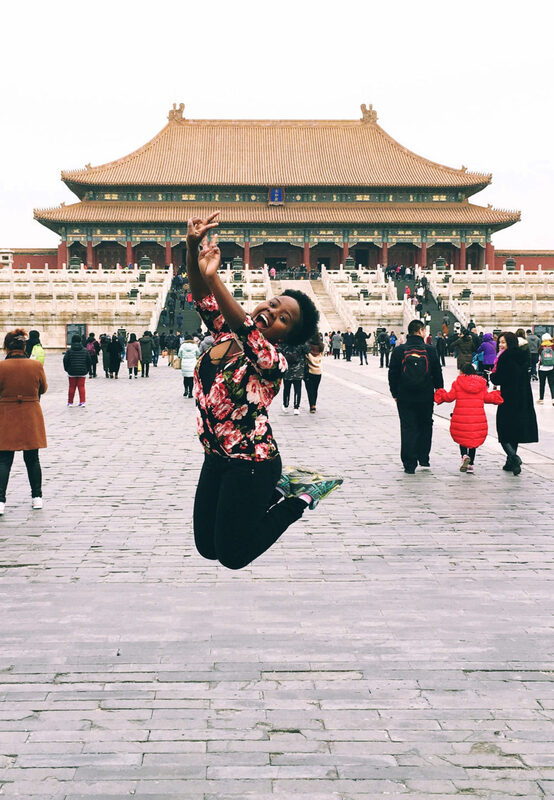 Junior Liliane Kevine Ikirezi, from Kigali, Rwanda, at the Forbidden City in Beijing. This spring, junior Liliane Kevine Ikirezi, from Kigali, Rwanda, spent spring break studying in China as part of the School of Engineering and Applied Science’s semester-long Penn Global Seminar on “Technology in Business and Society” which included a weeklong immersion in Beijing and Shanghai. The Penn Wharton China Center has been instrumental in extending Penn’s influence and reach. 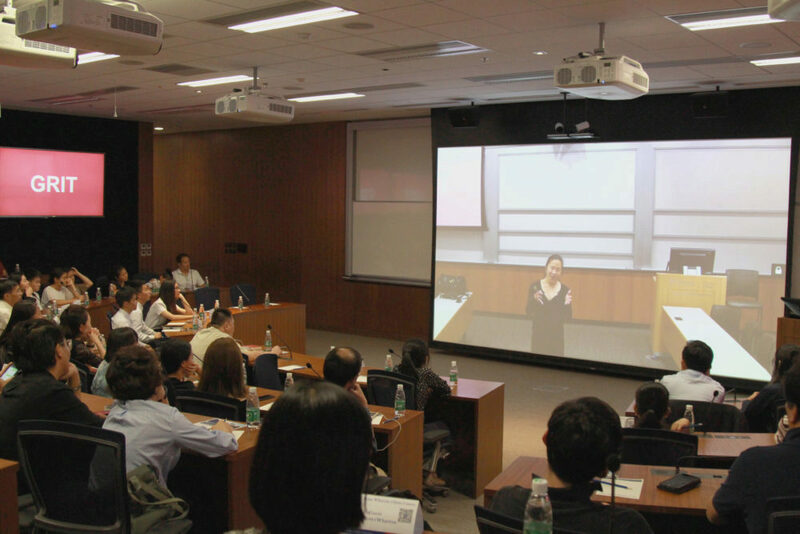 Angela Duckworth of Penn’s Department of Psychology speaks to a Chinese audience via telepresence as part of the Penn Wharton Research Frontiers Speaker Series at the PWCC. As part of this reach, advanced teleconferencing capabilities allow for real-time exchange between the campus and the Center. The new Penn Wharton Research Frontiers Speaker Series, launched in March 2017, allows Penn experts to speak to Beijing audiences on a range of research topics across many miles. Series speakers have included School of Social Policy and Practice Dean John Jackson with former Philadelphia Mayor Michael Nutter; MacArthur Fellow Angela Duckworth, the Christopher H. Browne Distinguished Professor of Psychology in the School of Arts and Sciences; Penn Engineering Professor Shu Yang; and Wharton Professor Kevin Werbach, among others. This story was adapted from a Penn Today article by Amanda Mott. Telepresence events since PWCC began its Research Frontiers Speaker Series last March. *All figures from 2015–2017 unless noted. This originally appeared as “China Connection’” in the Spring/Summer 2018 issue of Wharton Magazine.